The Town's goal is to plan, provide and reinvest in the infrastructure that meets future needs of residents and visitors. Infrastructure includes water and sanitary pipes, storm water pipes, roads, sidewalks, trails and pathways, parks and forests, and facilities. As a global tourism destination, and a national park community, we must build and maintain infrastructure that meets the highest environmental standards. Don't see a project? It may be a Parks Canada construction project. 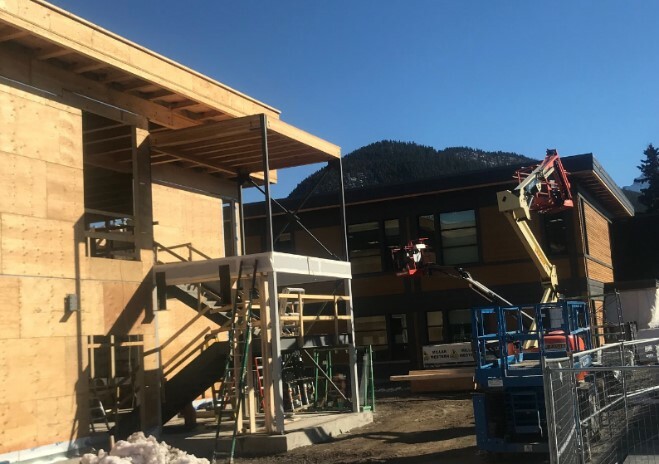 Project description & goals: Partnership with Canadian Rockies Public Schools to incorporate space in phase 2 of the Banff Elementary school redevelopment for Out–of–School Club and an expanded gymnasium to better suit the needs of the community. Current Status: Partnership with CRPS has been collaborative and productive. Construction is ongoing with completion scheduled for the Spring of 2019. 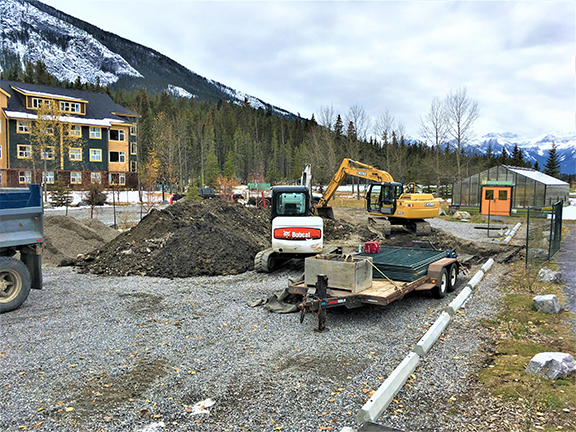 The Town has commenced design work for provide complimentary upgrades – sidewalks and formalized curb and gutter/parking to Bighorn and Moose Sts. Construction of these public realm upgrades are planned for next summer to be complete ready for the start of the 2019/2020 school year. Current Status: Audio components are substantially installed and complete. Project description & goals: the inspection, testing, service, repair or replacement of The Fenlands mechanical and structural envelope to ensure life expectancy is met. Project description & goals: Installation of an audible alarm system that can be heard over work noise. Project description & goals: 6 lots on Cave Ave have been earmarked for the development of affordable rental accommodation. TOB negotiated the release of lots 145-155 Cave Ave with Parks Canada based on specific criteria for release, with the intent the BHC will manage and own the property post construction completion. Current Status: Preliminary site analysis and geotechnical work has been completed, resident survey has been completed to determine potential interest in types of units and from a neighbourhood perspective. 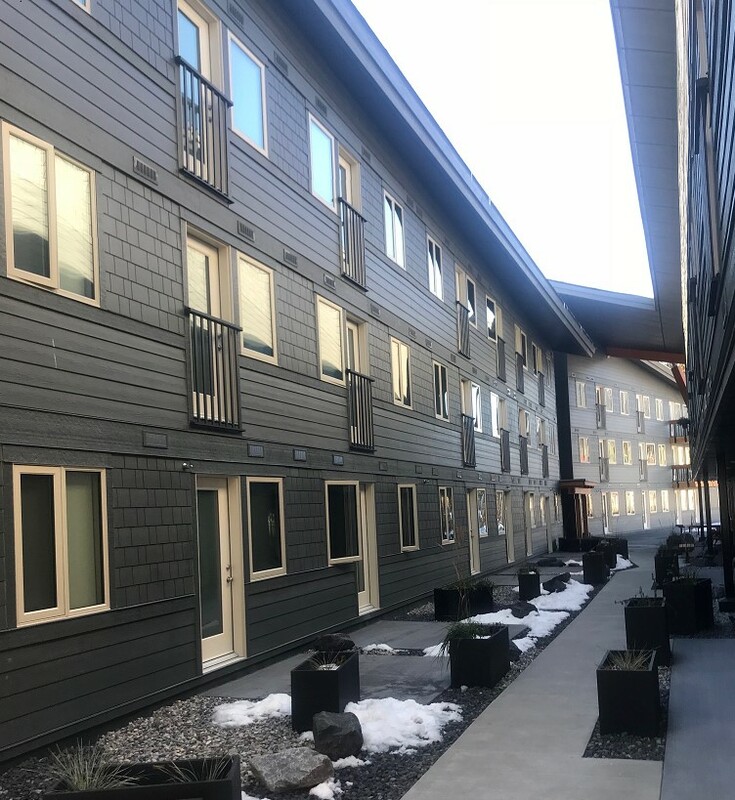 Currently preparing a report to council that will summarize activity to date related to rental housing projects that have occurred in Banff (and across Bow Valley) and rental housing demand since the community housing strategy was implemented. This will provide information that will assist council in making time frame decisions related to this project. 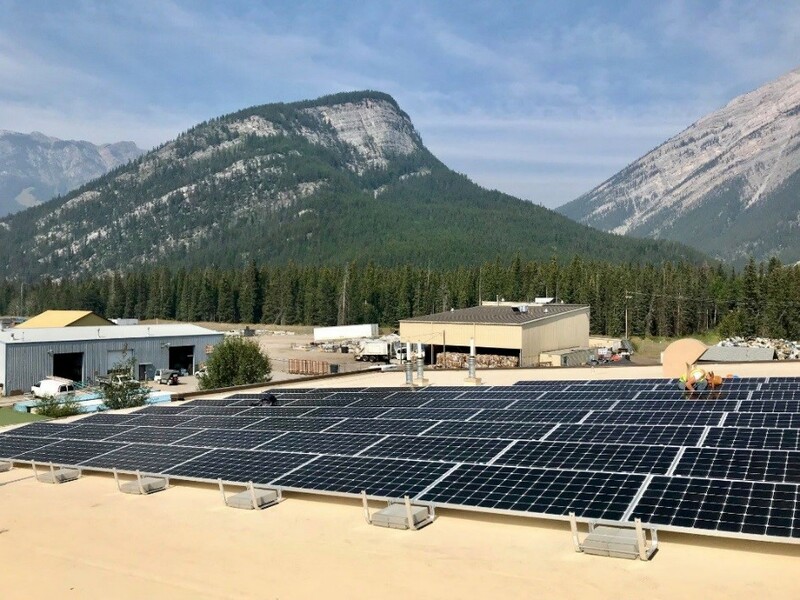 Current Status: The Banff Transit-Fleet Building in the industrial compound is the newest solar installation in Banff. Officially turned on August 24, 2018. Additional space for interaction with the public. Project description & goals: to purchase congregate lodging cots and pad for Emergency Social Services. Project description & goals: to purchase automated external defibrillators on a Ten (10) year lifecycle replacement schedule. Project description & goals: Purchase of 8 sets of bunker gear for 2017 recruit class. Project description & goals: Lifecycle replacement of firefighting hose. Current Status: Truck is in production with an anticipated delivery of November 2018. Project description & goals: to purchase 34 pagers on a five year lifecycle replacement schedule. The pagers are the primary mode of calling out fire department members in an emergency. 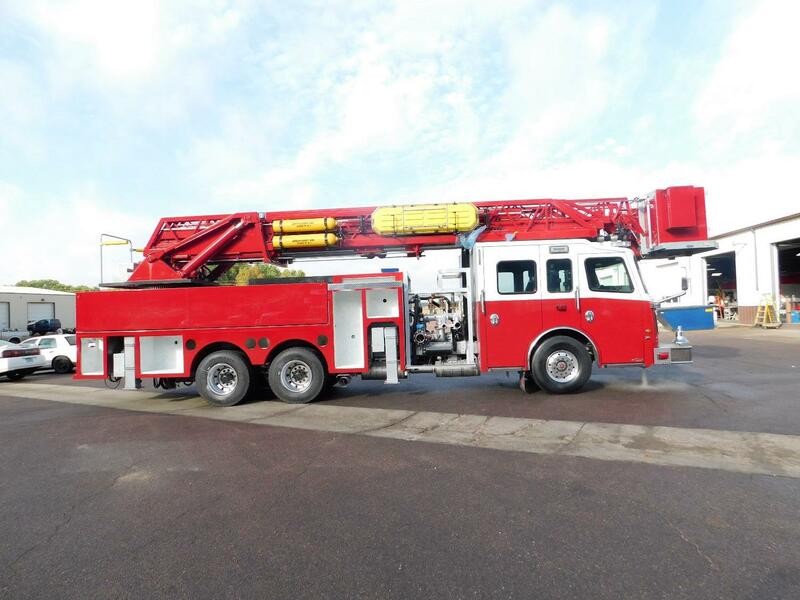 Project description & goals: to purchase six (6) type 5 slip in Wildland Urban Interface pumping units. These units consist of 150 gal tank, pump, 200 foot hose reel and associated equipment for pump and run tactics to extinguish small fires started by fire embers landing in the community. Project description & goals: Fleet Equipment replacement to align with Maximizing Life Cycle effectiveness, Green Fleet Policy C6000 & Equipment Task Right Sizing. Current Status: 10 Vehicles/equipment replacements were scheduled for 2018 with an additional 2 replacements carried over from 2017. Of the 12 total, 3 unit have been replaced with more fuel efficient/scope of work maximizing alternatives. 5 Units are in very good shape and can have their useful service life extended (these will be adjusted in the forecasted capital replacement budgets). 3 Units will be replaced in the next 6 months with Electric or Hybrid alternatives (Ice re-surfacer, parkade sweeper and a sedan/suv) and 1 unit will have a replacement with 4 season usefulness (current unit is only used in summer months). Current Status: Currently purchased 2 walk-behind power brooms, snow blower and a drop-down ramp to easily move the equipment around in interim. Currently evaluating machinery that best fits the scope of work and narrow sidewalks. 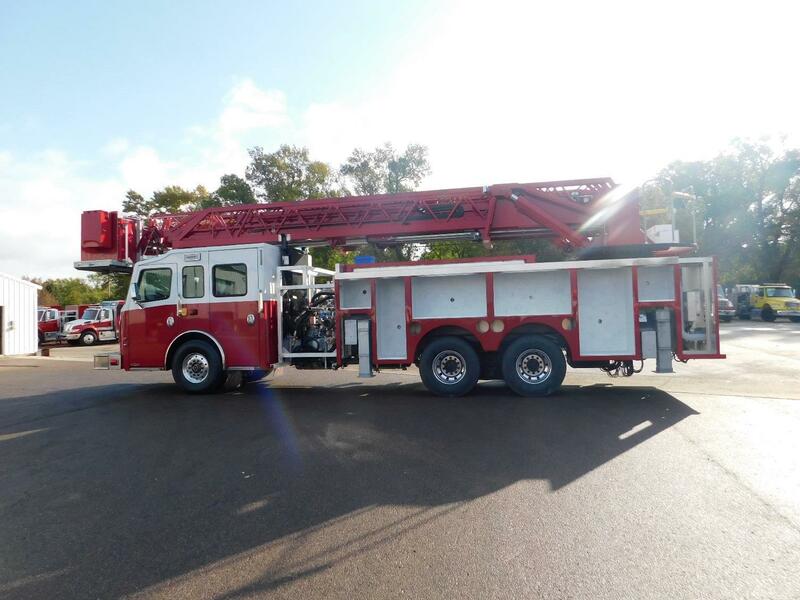 The balance will be carried into 2019 with a request to blend approved capital and vehicle replacement dollars to purchase an appropriate multi-function machine for both summer and winter use. Project description & goals: Design and construction of projects identified in the Recreation Grounds Master Plan. Multi-purpose building – geotechnical investigation complete, discussions ongoing with Frank Lloyd Wright initiative to establish if feasible to combine multi-purpose building with proposed rebuild. Further scope definition required in 2019. Project description & goals: This project supports council’s priorities of transportation, trails, recreation and environment by creating approximately 180 net new bike parking stalls in key areas, mainly in downtown and at major trail connections. Current Status: 94 bike parking stalls were added in 2016 and a further 190 stalls were added in 2017. The total available stalls is over 800. The original project goal was exceeded by 104 for total added capacity of 284; $29,000 under budget. Demand for further increases in capacity exists in additional locations and project savings can be directed towards additional racks. In summer 2018 bike rack capacity for 8 bicycles was installed at the Rec Grounds. 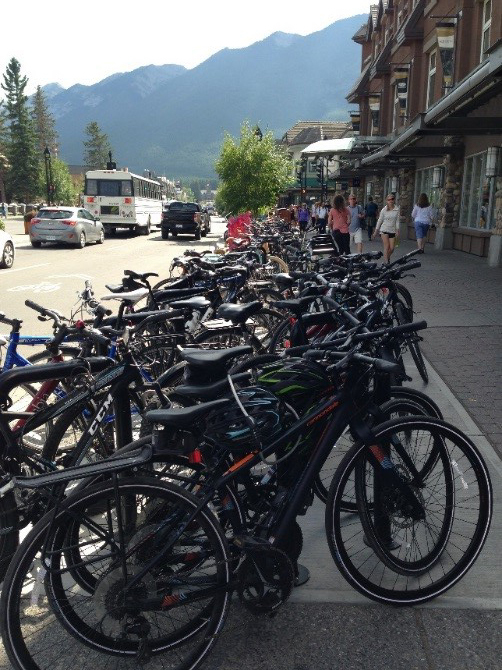 In autumn 2018 bike rack capacity for 6 to be installed in Bear Parkade and weather permitting, bike parking capacity for 16 will be added in 4 locations along Banff Avenue. Project description & goals: Improve Bow Falls Viewpoint by formalizing and re-surfacing trails and viewing areas, installing fencing to protect existing vegetation, constructing a new viewing platform and installing washrooms. Current Status: Preliminary design work is complete and will be presented, along with the results of a visitor survey, to council to help inform the scope of the project. Project description & goals: Relocation and reconstruction of central park washroom. Current Status: The new washroom facility was opened to the public on July 1 2015. Outstanding deficiencies were completed in 2016. Remaining unspent funds to be returned to the reserves. 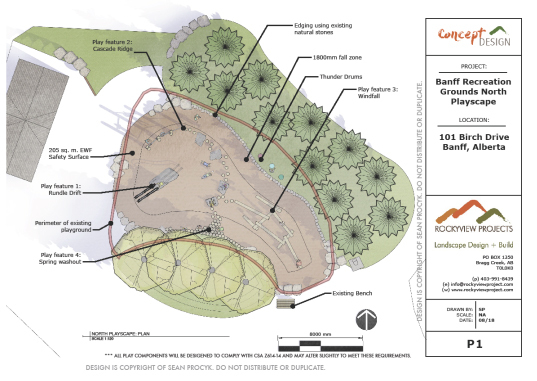 Project description & goals: The development and installation of a columbaria, scattering garden and memorial wall at 606 Buffalo Street on Town-owned lands, outside of the Old Banff Cemetery. Both the adjacent Old Banff Cemetery and the Transformer Substation are protected municipal heritage resources and require some special considerations. Current Status: Structural investigation of the Banff Transformer Substation to determine if the building is suitable for the use of an enclosed columbaria has been completed. The results of the engineering report and options for landscaping, interior and exterior columbaria structures and scattering garden will be presented to Council and along with proposed project timelines and design development scope in Q4 2018. Project description & goals: The Commonwealth Walkway program is designed to encourage active modes and commemorate the values of the 71 commonwealth nations and territories. 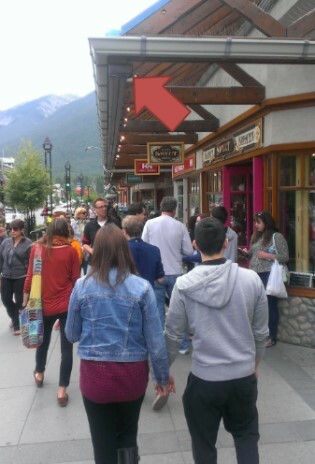 Banff was chosen as the location for Canada’s Commonwealth Walkway. 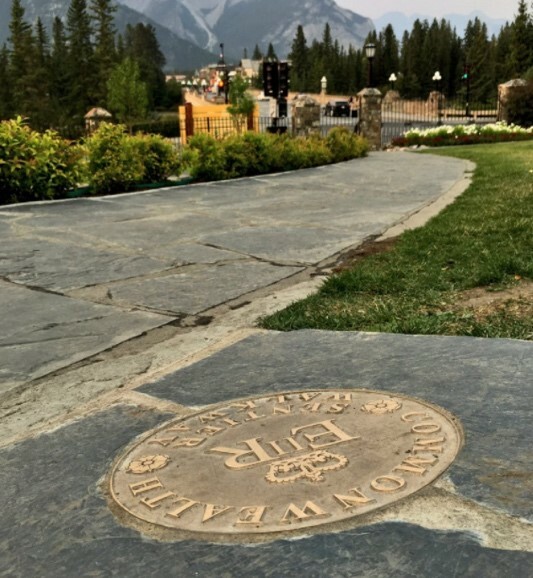 Installation of bronze markers form trails for self-guided interpretive tours around Banff townsite and the national park. 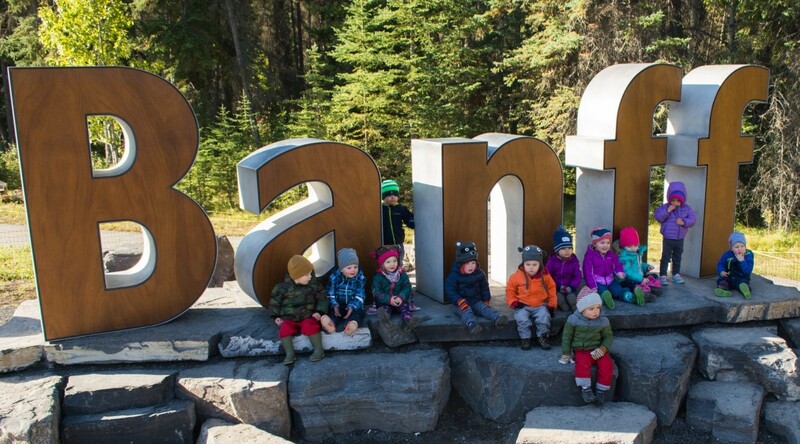 This project is in partnership with Parks Canada, The Community Foundation of Banff and Canmore, Banff & Lake Louise Tourism, The Fairmont Banff Springs and Banff Centre. 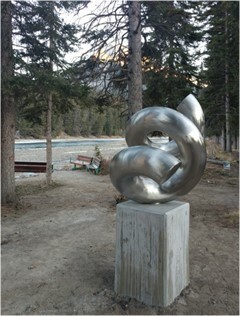 Current Status: Project is complete, $24,000 under budget – 38 markers have been installed to form four trails radiating from a hub at the corner of Banff Ave to 1) Vermillion Lakes, 2) Sundance Canyon Day use area, 3) the Spray River trailhead via the Banff Springs Hotel and Bow Falls and Tunnel Mountain via the Banff Centre. Route tour descriptions are online at banff.ca/commonwealthwalkway and banffcanmorecf.org. This initiative completes the Visitor Loop recommendation in the Trails Master Plan. Remaining funds will be returned to the reserves. Project description & goals: Design and construction of a deep water line and foundation in 2018 to host a new greenhouse structure to be installed in 2019. Current Status: Environmental Assessment completed and approved; water line and foundation to be substantially complete by the end of 2018. Project description & goals: Upgrade obsolete operating system which assists with regulatory cemetery records and information. Current Status: Project delays due to supplier organizational structure changes; expect to be completed by year end 2019, awaiting contract finalization and implementation. Project description & goals: Upgrade existing exhaust fan to assist in larger volume of air movement through the greenhouse building. Project description & goals: Provide a safe, protected cycling experience from the west end of the Banff Avenue Legacy trail into Banff. Current Status: Traffic studies were completed and conceptual design integrating the Legacy Trail, adjacent developments (Husky, Voyageur Inn, Inns of Banff) and the Banff sign were completed. The project needs to be coordinated with Parks Canada due to proximity to the town boundary. Construction is planned for fall 2019.
and drivers. Application for project funding support has been made to Trans Canada Trail. Project description & goals: To repair damaged curbs and remove excess vegetation and regrade and level driving surfaces. Current Status: Oct. 2, 2018 saw significant snow amounts with the project postponed until Spring 2019. Current Status: a complete land survey was conducted, concept drawings for full integration with other proposed west entrance improvements, and traffic study. Construction of trail and new lighting on track for 2019 construction. Project description & goals: Upgrade the Middle Springs Cabin windows in efforts to reduce vandalism. Included the install of plexiglass panes over windows to maintain the look and character of the building. Current Status: Carried forward to 2019. Will be undertaken in conjunction with other projects scheduled for the facility inclusive of floor repair/replacement. Project description & goals: Implement the recommendations identified in the Trails Master Plan. 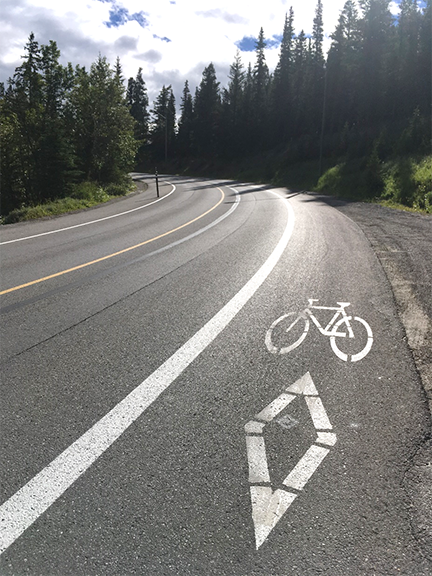 After extensive public consultation, on-road active transportation routes (painted lanes) on Tunnel Mountain Road and Buffalo Street were completed in time for summer 2018 usage. Bow Falls Road mixed use trail with horses or expanded road shoulder are currently being designed. Bow River Trail, from the pedestrian bridge around Central Park to Wolf Street: pre-design complete for recommended widening to 3m. Administration will be seeking council direction on scope in 2019. Trail signage upgrades: 200 signs were designed and installed, along with 20 net new posts at key locations. 30 new mini maps were designed and installed for visitor orientation. 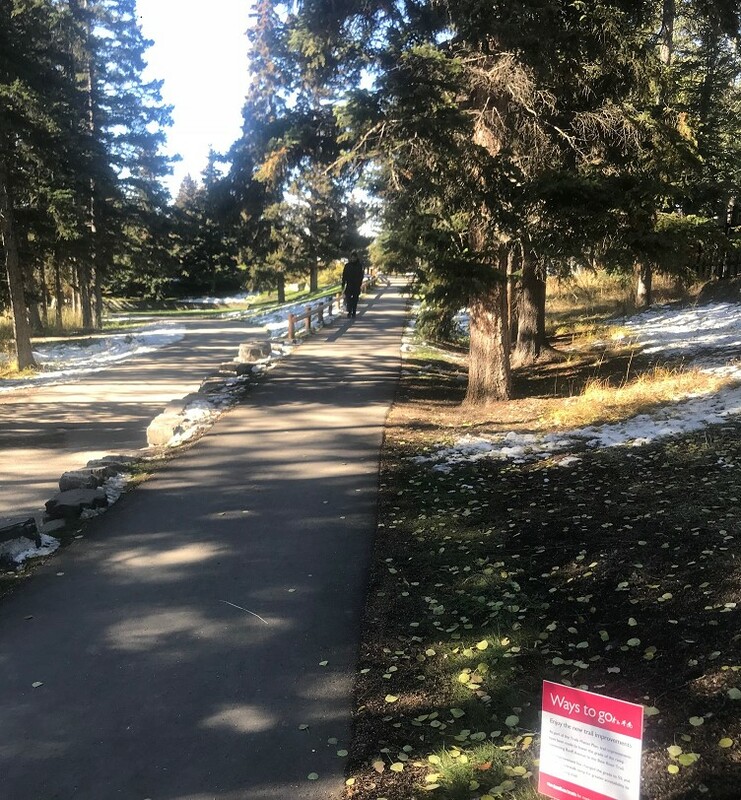 Whyte Museum trail connector, from Bear Street to Bow Ave: Agreement is being developed. Procurement is complete and construction is planned for spring 2019. 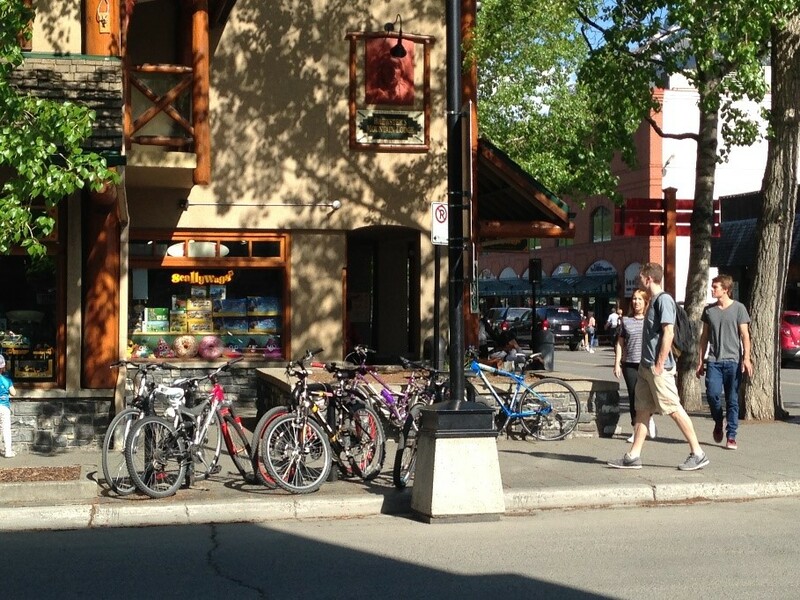 Twelve bike boxes were painted at downtown Banff Ave intersections for a safer cycling experience. 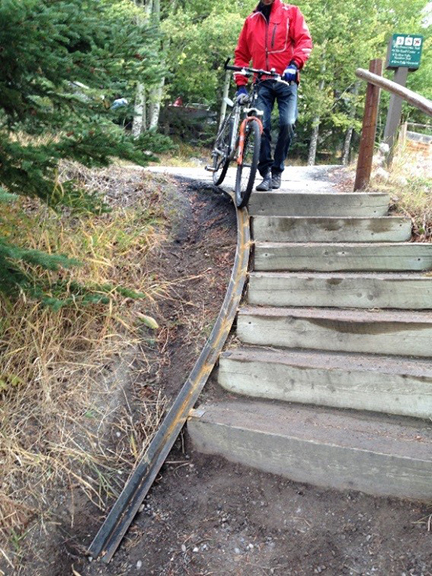 Upgrade all staircases on trails to include a bike ramp or rail. 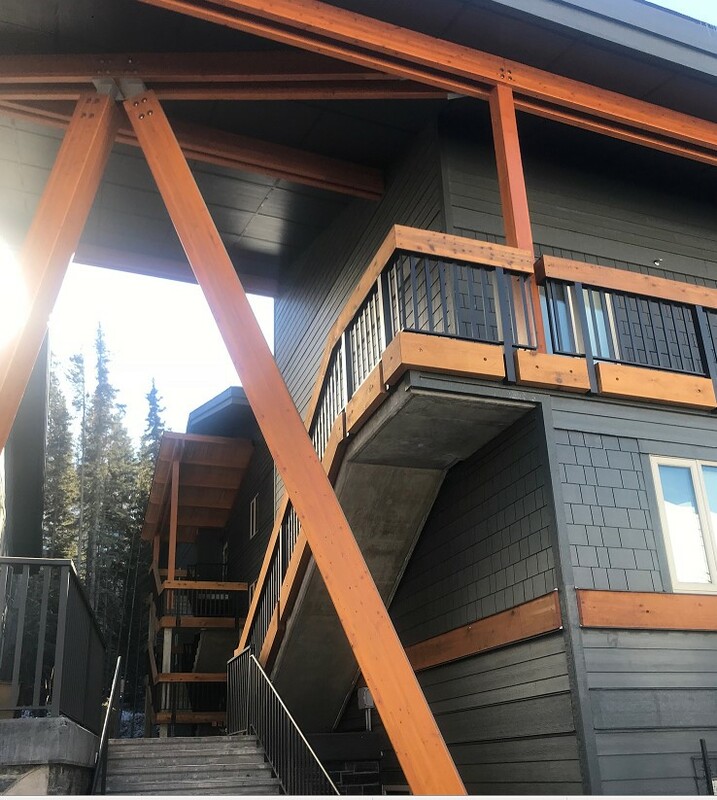 Four feasible staircases were upgraded with a bike ramp or rail in 2018. Other staircases were either too narrow or already had a natural gravel ramp. Evaluate existing bike sharrow pavement markings – evaluation completed by consultant Stantec. Gather shared bike use statistics from hotels – on-going. Update web-based maps as trail improvements occur – in progress. Update print base maps after key phases of trail improvements are completed – in progress. Amend bylaws to limit rickshaw and horse use on trails – Traffic Bylaw changes completed. 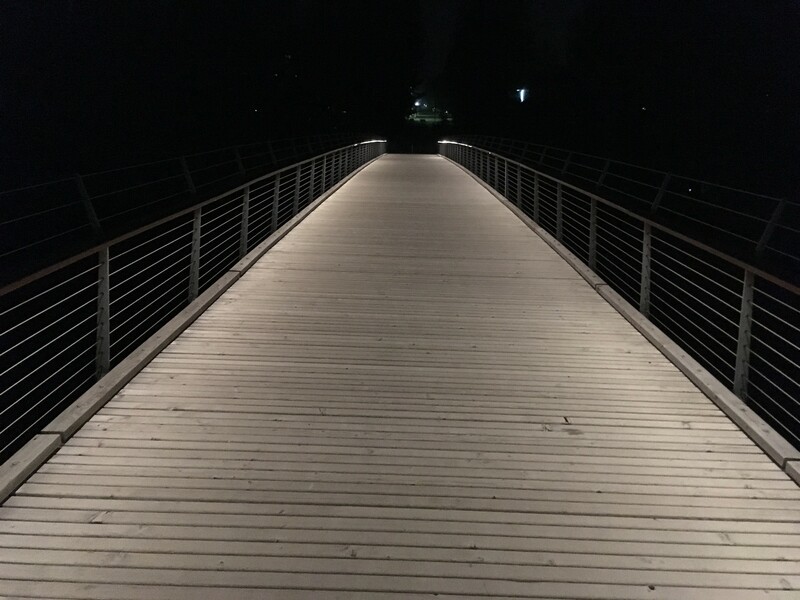 Project description & goals: Replacement of the pedestrian bridge lighting in line with the Trails Lighting Policy. Now dimed and more directional toward centre. Current Status: Complete. Design of the accesses to the pedestrian bridge from Buffalo Street and Glen Avenue is underway for 2019 installation. 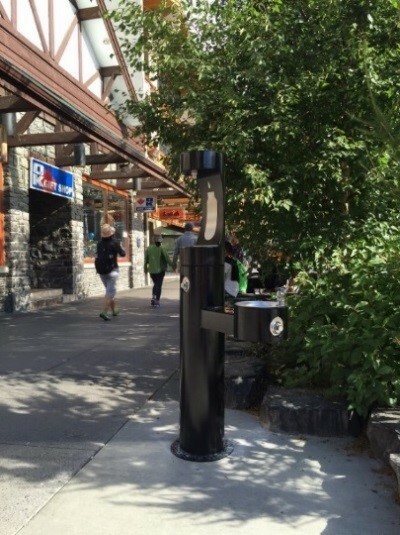 Project description & goals: Installation of 4 free-standing water bottle fill stations in downtown area along Banff Ave.
Current Status: Three stations have been installed, a fourth station will be installed close to Cascade Plaza in 2019. Project description & goals: Installation of a smart parking system to help guide drivers to available parking stalls. Current Status: Real time parking stall monitoring was installed in nine lots from 2015 to 2017. 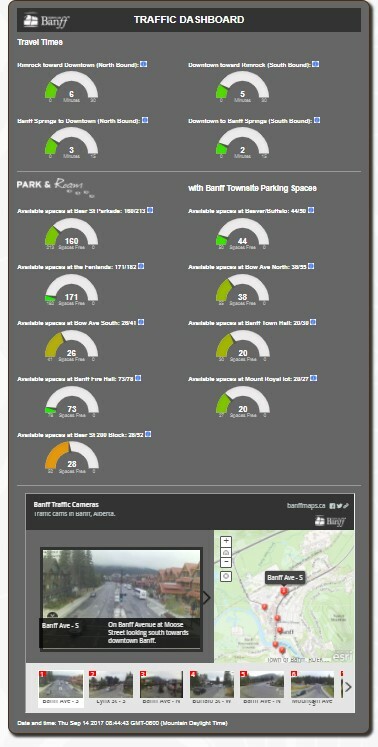 Local signage is provided by the lots and real time data is available on the traffic dashboard. 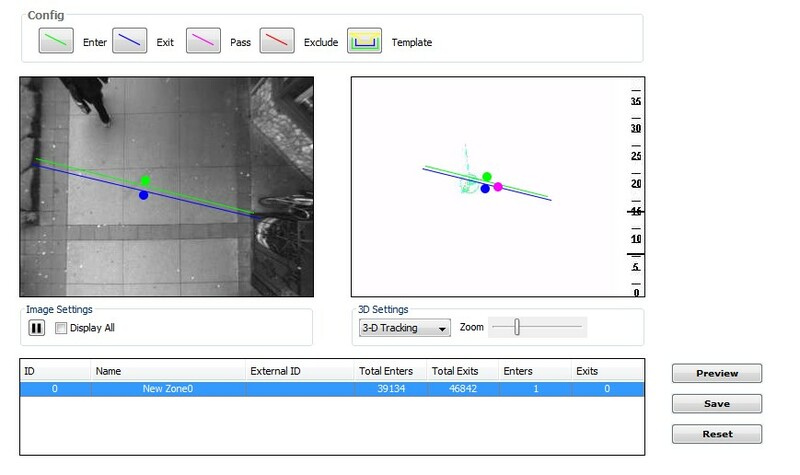 Accuracy issues have been identified in small lots with high stall turnover – where a 1% miscount of several thousand vehicles per day can compound to lot-count inaccuracies to a scale greater than 10% of the number of stalls. Tail-gating and cyclist/motorcycle/trailer-use of the lots also tends to exacerbate inaccuracy issues with the gate-counter technology implemented. Alternative technology – using overhead cameras with digital counting algorithms to monitor individual stall occupancy – will be installed as a trial in the Town hall lot and, if successful, will be installed in other suitable lots where accuracy issues continue to be an issue. Project description & goals: Installation of six pedestrian counter stations on Banff Avenue, Caribou Street, Bear Street and Wolf Street. Current Status: Five monitoring stations have been installed using stereoscopic video counting technology, which can detect pedestrian volumes and heights for traffic occurring beneath it. Accuracy rates are validated in the 90% to 100% range, although only traffic passing beneath the unit is measured. Weekly count data is currently being distributed to TOB staff, BLLT, and hosting landlords. Current Status: Bus purchase complete and fully funded through PTIF and GreenTRIP funding. Unspent funds to be returned to reserves. Project description & goals: Design and construction of transit shelters or other user improvements at key bus stops. Current Status: Design is ongoing. Approximately 5 shelters are planned to be built in 2019. Other bus stop improvements to improve route connectivity and marketing (signage) are being developed. Project description & goals: The original goal of this project was to Increase parking density along streets where enough right-of-way is available. Current Status: Council directed administration to focus on the streets adjacent to the Banff Elementary School. It was then decided to delay the project to complete the work in conjunction with the rebuilt of the school. Design consultants have been engaged to develop designs for sidewalk/curb and gutter along Big horn and Moose Streets to formalize parking around the Banff Elementary School. It is unlikely that parking capacity will be increased, but rather existing parking will be formalized. Construction is planned for the summer of 2019. Project description & goals: Purchase, install and operate 4 additional BluFAX devices for monitoring traffic. Expanding the network will grow the sections of roadway being monitoring and increase the accuracy of data. Current Status: Complete. New routes have been added to the traffic dashboard website. Current Status: Building size and performance specifications are being developed with the BVRTSC and Fleet. Cost sharing of the operating costs of the facility are being discussed with the BVRTSC commission members. RFD to confirm project scope and location will be brought to council in Q4 2018. Project description & goals: Development of a transit hub to connect between regional and local routes. Current Status: The Dillon Banff Local Transit Service Review has recommendations on the location of a transit hub on the 300 block of Banff Avenue. 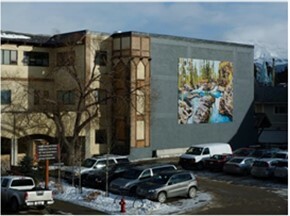 The hub is located on both sides of Banff Ave at Elk Street. The hub will serve the users of routes 1, 2, 3, 4, 6, 7, 8 and On-it. Construction is planned to be substantially complete by the end of 2018. Project description & goals: Re-construction of Bear Street to permanently foster pedestrian priority. Current Status: In 2018, council directed administration to replace the deep utility services and to prioritize the street design of the pedestrian and cyclists over motorised transportation. Also in 2018, council directed administration to eliminate all on-street parking with the exception of two accessible stalls. Following these decisions, a consultant was retained through a Request for Proposal process to lead the development of conceptual designs. The concepts will include Bear, Wolf & Caribou Street and administration plans to present them to council by early 2019. 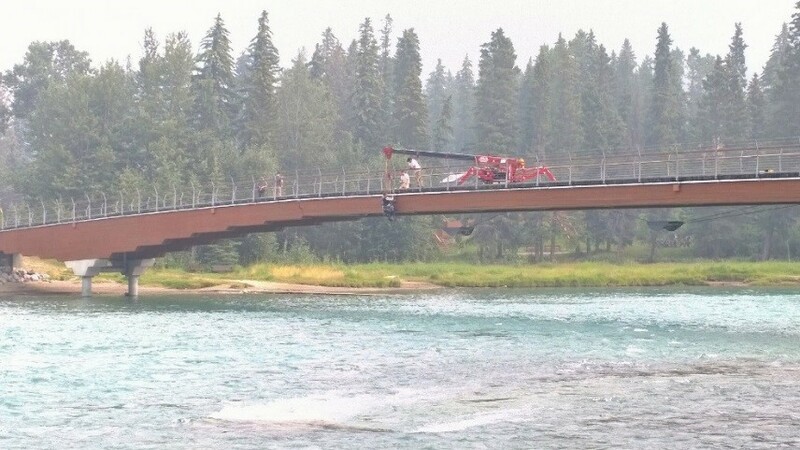 Project description & goals: The Bow River Bridge was designated a municipal heritage resource in December 2016. Council committed funding from both a Capital Project Allocation and the Municipal Heritage Reserve. The project scope includes rehabilitation of the decorative masonry along the northern retaining land pier and the first river pier along the northern shoreline. The scope of work is purely cosmetic. Current Status: The Town was successful in receiving a grant from Alberta Culture of $11,920 to help fund this project, the grant falls short of the $150,000 required to complete the work. The project has been tendered and pricing is not within the approved funding limits. RFD will be presented to council to seek direction on project funding and scope. Project description & goals: Inspection of all town trail bridges and replacement of the Marmot Crescent culvert. Current Status: The inspection of all trail bridges was completed by a consultant. Minor repairs and further inspections are required. This work is planned to be performed within the remaining capital budget. The Marmot Crescent culvert replacement contract has been awarded; construction is ongoing and is scheduled to be complete by the end of 2018. Project description & goals: Complete reconstruction of Cave Avenue from the Luxton Museum to the Cave and Basin National Historic Site. The scope included burial of overhead utilities, reconstruction of the water, sanitary and storm systems, new curb and gutter both sides of the street and sidewalk on the north side, new street lighting on the north side of the street, reconstruction of the full road structure. Current Status: Asphalt cracks have been sealed. Project complete $180,000 under budget. Remaining unspent funds to be returned to reserves. Project description & goals: Support the replacement and re-design of Fortis managed street lights along Gopher Street and Lynx street. Current Status: Detailed design has been completed for phase 1 of the project and the projected construction date is November 2018. 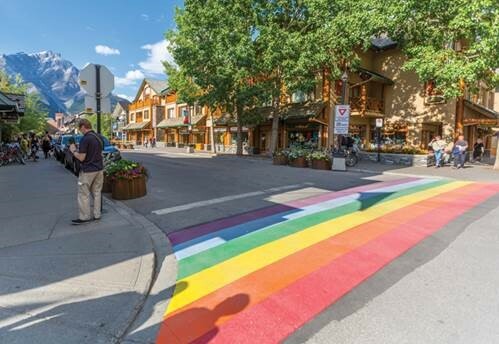 Project description & goals: The Town of Banff is developing Streetscape Design Guidelines that describe standard roadway configuration options and overall style for each of the public street types in Banff. Developing streetscape design options collectively will provide a unified design standard for future roadway reconstruction projects and individual infrastructure improvement projects. Current Status: Administration is currently working with a team of professional landscape architects and engineers to develop streetscape design options that include cross-sections and detailed plans. The goal is to finish this project in 2018. Project description & goals: Design and potentially implement roadway improvements relating to the construction of an intercept lot located east of the railway station. Current Status: Initial design work has commenced on temporary changes at the Railway / Elk / Lynx intersection. Any proposals for permanent improvements will be returned to Council in order to address funding and related implications. Project description & goals: Prioritized roadway overlays across the townsite to prolong the life of the road surface. ~10 localised patches associated with utility repairs or local deterioration of the road surface. 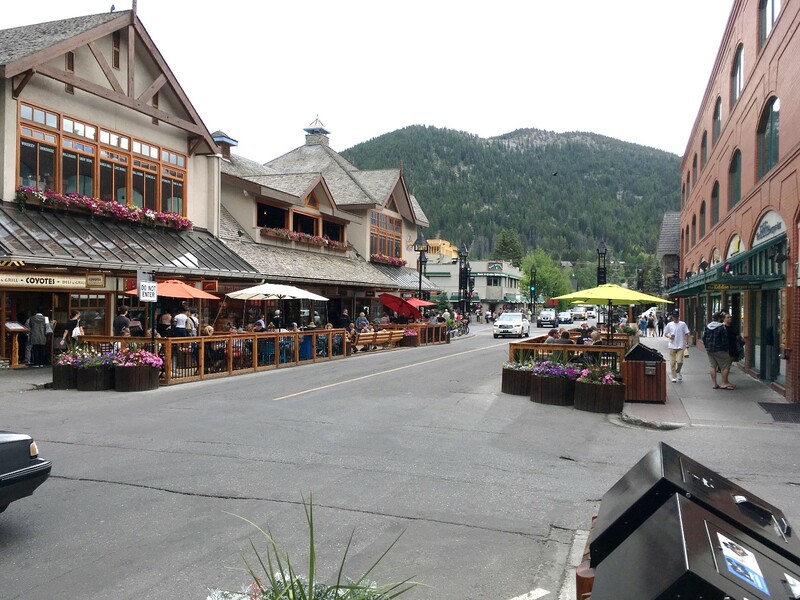 Banff ave overlay was re-scheduled to 2019 due to weather conditions and the risk of creating issues with the pavement surface and road substructure by attempting the work in less than ideal weather conditions. The last town wide pavement assessment was carried out in 2014 and is in need of update; in 2019 the town will engage an inspection company to carry out a condition assessment that will inform future year’s scopes. Project description & goals: Complete a series of upgrades and replacements to maintain and improve the quality of sidewalks. Current Status: The Town have engaged a consultant to develop streetscape design guidelines to develop concept templates of how street cross sections to better inform how we build and replace right of way infrastructure, including our sidewalks, in a more integrated fashion. This design work should be complete by the end of the year. Also this year a full review of our sidewalk conditions has been undertaken as per policy C7001, a report will be provided to council in September. Two high priority wheelchair ramps near the hospital were also replaced. 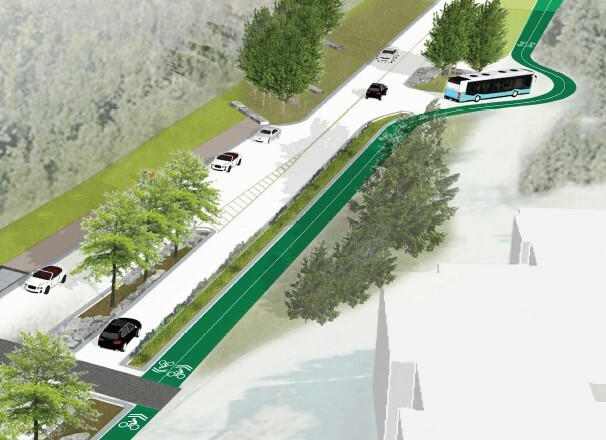 Project description & goals: Reconstruction of St Julien Road to enhance pedestrian & cyclist connectivity, lighting and storm water management. Current Status: The sewer line under St Julien was inspected in 2018, to assess the condition of the line and determine if it should be replaced during this scope of work. Design has been prioritized with other projects and is pending the results of the streetscape design project (currently underway). Project description & goals: Retrofitting of existing Town-owned street lights with energy-efficient fixtures. Current Status: Design work is underway for the Moose Street/Moose Hotel area. LED fixtures have been ordered for two remaining locations to be installed in 2019. Project description & goals: Permanent line painting at crosswalks and other important intersections. Project description & goals: Implement seasonal pedestrian improvements over the next few years to reflect the Banff refreshing standard. The new streetscape provides adequate space for active or passive pedestrians while responding to the new AGLC requirements and Sidewalk Seating/Cafe Policy. Current Status: Complete, but minor improvements may occur in years going forward. Current Status: Project has been awarded with installation to happen in Q4 2018. Project description & goals: Construction of a food waste storage area to enable the consolidation of trips to the Waste Water Treatment Plant (WWTP). Reducing operating costs per tonne and the number of wildlife disturbance events are the principal project goals. Current Status: This project is linked to a consideration of potential improvements to bio-solids & food waste processing. A temporary ramp will be created and roll-off bins used to bulk and decant Food waste liquids before shipping to a compost facility east of Calgary. Project description & goals: replacement of selected pedestrian bins at the end of their natural life cycle. Current Status: Finishing the wood cladding on this year’s bins with plans to exchange old for new by years end. More bins to be replaced in 2019. Project description & goals: enhance appearance of the residential area bins. Current Status: Have temporarily put this project on hold to wait the outcome of the targets and tactics presented at the 2019 Service Review but will replace residential bins as needed. Current Status: Purchase has been awarded, awaiting for grapple to arrive and be installed. Project description & goals: Repair of building siding and installation of a steel containment wall to increase capacity of the waste transfer site. The project will resolve storage shortages that arise when the West Dried Meats Lake Landfill is closed. 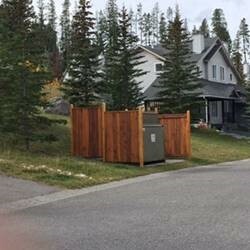 Discussions are ongoing with the Bow Valley Waste Management Commission regarding cost sharing for the upgrades. Current Status: Now that business in the Transfer Station has slowed, the distorted exterior sheet metal has been replaced. 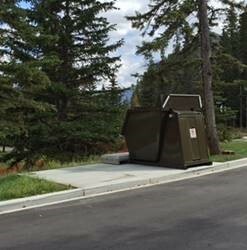 The Bow Valley Waste Management Commission’s engineer to review Banff’s stamped drawing in order to access BVWMC funds for a portion of the improvements. Project description & goals: Replacement of the pipework carrying all sanitary waste across the Bow River by suspending 2 new sanitary force-mains to a new pedestrian bridge. The concept used funds allocated to excavation and environmental protection related to a recommended open cut solution to complete the pipework and pedestrian bridge within the project budget. Current Status: project complete. 4,000 average daily crossings in July and August 2017 (250,000 crossings). Upgrades to the level detection, mixer, grinder and odour control systems to mitigate the effects of rags and grease in the collection system have been completed within the project budget. Remaining unspent funds to be returned to reserves. Project description & goals: In 2018, council directed administration to replace the deep utilities. Design will be integrated with the new streetscape design. Project description & goals: Using condition assessment data, prioritize and complete sanitary sewer repairs as budget permits. Current Status: 2017 funds were directed towards the replacement of 220 metres of pipe along Glen Avenue that was found to be in poor condition. 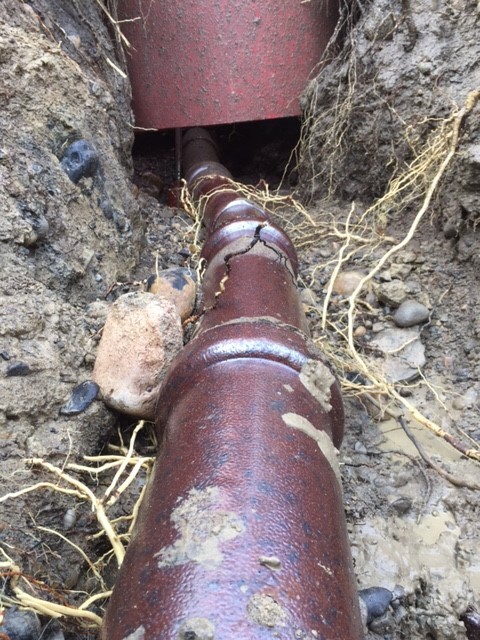 This pipe replacement work is complete and the pipe is back in service. 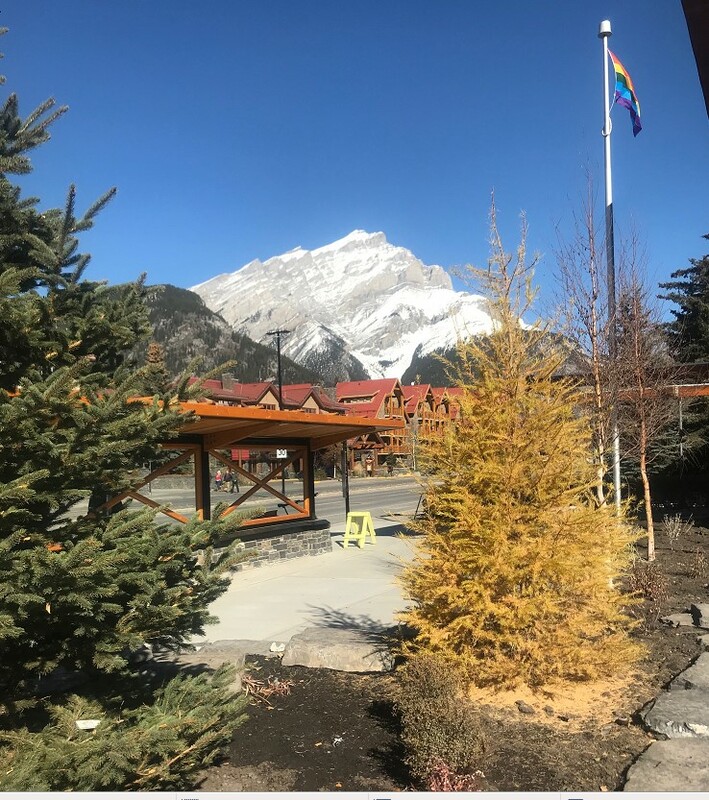 RFD to council requesting funds be moved ahead from the 2019 budget year to 2018 to address an emergency service installation to the Banff Springs Hotel. Work is progressing this fall weather dependant. Current Status: Design work complete and project is out to tender. Project description & goals: Cleaning and condition assessment of the sanitary main from Glen Avenue to the Waste Water Treatment Plant. Current Status: Cleaning is complete and the majority of the line was found to be in good condition. Council directed savings from the cleaning project to the replacement of 220 metres of pipe along Glen Avenue (above). Work completed, remaining unspent funds to be returned to reserves. 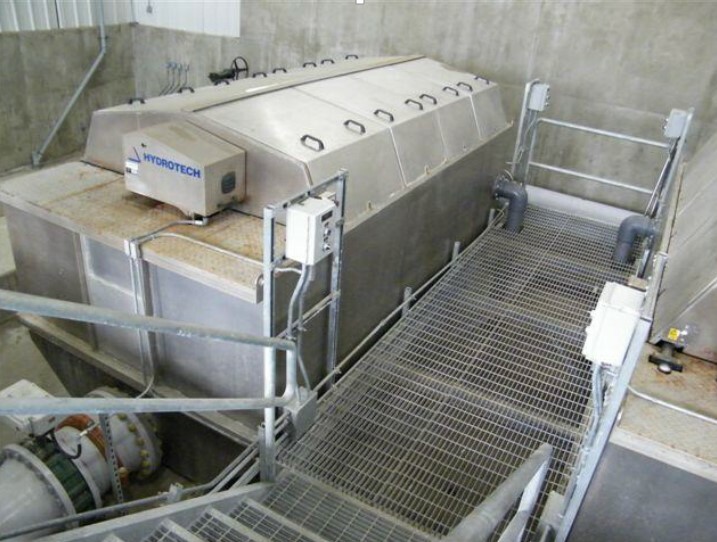 Project description & goals: Upgrades to maintain operational efficiency and effluent quality. See individual project descriptions and current status below. Design–Build contract has been awarded to Tritech Group Ltd. Communicated with Parks and Alberta Environment to identify regulatory requirements. Honeywell building management system controls the HVAC system of WWTP. Migrating HVAC control narrative to SCADA system eliminate the annual license and maintenance fee. Current Status: The project has been completed. Three clarifier drives have been leaking for the last couple of years. Installation of purchased drives schedule in 2017–2018. Current Status: New chlorinator is on site, awaiting proposals for ventilation system and flow pacing equipment. Project description & goals: Install emergency generators at key locations to safeguard critical needs in the event of prolonged power outage. Current Status: Generator installations have been completed for Town Hall (which included Central Park lift station and upgrading electrical infrastructure along with a new event panel for Central Park). Additionally, Elk Street, Whiskey Creek, Marmot and Birch Street sewage lift stations generator installations are complete. 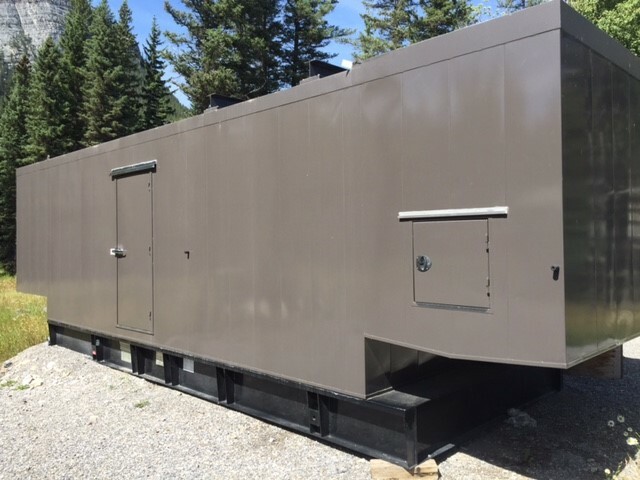 The 600kw generator for the wellhead water supply has been delivered but not commissioned. Administration is working with Parks Canada and Associated Engineering to finalize a path forward regarding a permanent location. Town is in alignment with Environment Canada guidelines for placement generator in current location. Parks Canada has chosen to conduct independent analysis on generator placement. Awaiting results of Parks study. 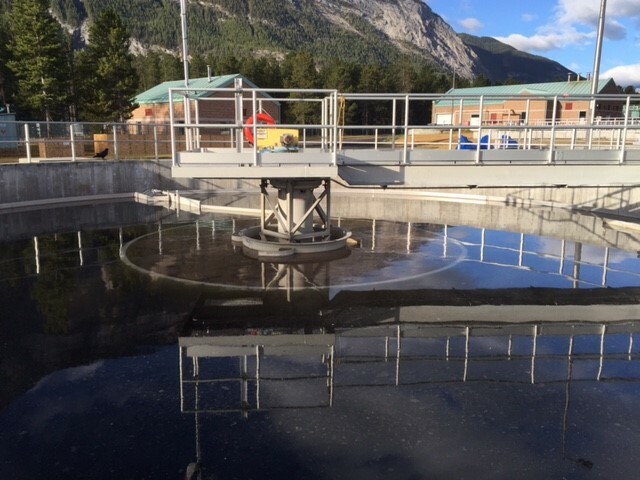 Project description & goals: upgrades to the Supervisory Control and Data Acquisition (SCADA) system used to monitor and operate the town’s water and wastewater systems. Current Status: WWTP communication between PLCs switched to fibre optic, faster and reliable. Commissioning and testing have been successfully completed. The merger of distribution & collection and WWTP have been completed. PLC updates at Middle springs and Mountain avenue booster stations round out the project. 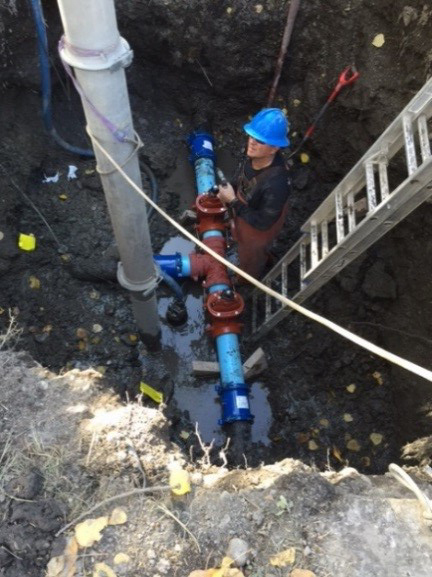 Project description & goals: Using condition assessment data, prioritize and complete valve repairs or replacement as budget permits. Current Status: 2018 phase one Mountain Avenue completed which entailed service relocation and the capping of the 150mm water main on Mountain Avenue to prevent mainline freezing conditions. 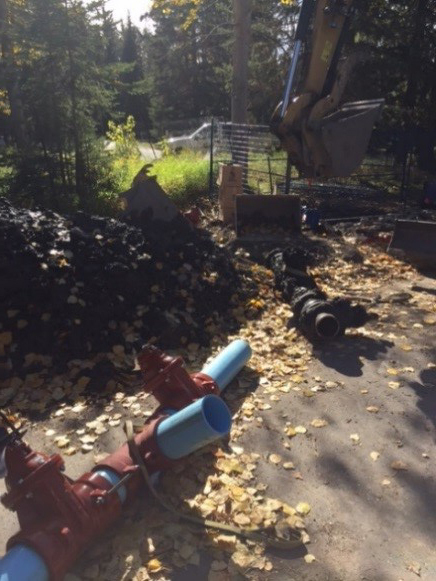 Phase 2 is the relocation of the fire hydrant on Mountain Avenue and capping the main north of parks administration building. Work scheduled to be complete this fall weather permitting. Project description & goals: Update the current radios to multi-band AFRRCS compatible radios to effectively communicate with RCMP and other response agencies. Current Status: Currently, the RCMP is working on transition to the AFRRCS system, Bylaw radios will be purchased once the RCMP transition is made. This initiative is moved into 2019. Project description & goals: Using condition assessment data, prioritize and complete catch basin repairs or replacement as budget permits. Current Status: 38 catchbasins with surface damage (grates or localized settling) were repaired in 2018. 2018 is the final year of this program however there is some carry over budget that the Administration intends to use to complete more surface repairs of catchbasins in 2019. Administration will also undertake an assessment in 2019 to inform future funding requests for storm water infrastructure. Project description & goals: Electronic forms which can be filled out and submitted from any ToB mobile device. Current Status: Complete, final invoicing pending. The use of e–forms is resulting in improvements in efficiency of operations in the field and in the quality of data available for use by all staff. The initial electronic form project saved completed forms in pdf format. These were not searchable. It was hoped that this form saving process would be modified to save competed forms in a database format, but when the project was started there was no internal capability to do so, and it was intended that a third party would be engaged and paid to complete this conversion. In 2015-16 John McAulay, IT Coordinator, ToB IT department, converted all existing forms to be saved to a database. John continues to work with ToB form creators to ensure new forms are configured to insert completed information into the database. Now that the database conversion has been completed, and is the repository for form data, a greater detail of data reporting and a more streamlined search function is possible. At the moment reporting is performed by a request to the IT department. The next step will be to complete a user accessible reporting mechanism, which has been started by IT, working with Fleet Services. Project description & goals: Update of financial software to current version including training for staff on the software. Current Status: Substantially complete. Administration is exploring options for the replacement of our job costing software with the remaining budget. Project description & goals: In 2015 council accepted the Information Governance Master Plan as a guiding document for the Town’s information governance program. The plan is a multi-year, multi-phase forward roadmap to achieve an essentially complaint information management. The capital project approved in 2017 is for expenditures for electronic content management (ECM) and electronic records and document management systems (EDRMS) systems. Current Status: Continued implementation of the IG Master Plan foundations. A technology ready Information Governance Policy and Retention Schedule will be presented to council in Q4, 2018. The IT Coordinator worked closely with the Town of Canmore in the implementation of their pilot project. Once the best practices and learnings from the Canmore pilot project are fully developed, work will commence the final procurement of the required technologies. 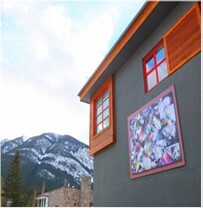 Project Description & Goals: Commission 4 artworks for 4 ½–year temporal exhibition at Bear Street Mall and Banff Town Hall; proceed with fabrication of all artwork exhibition materials/hardware and required installation. Current Status: Bear Street Mall exhibition (When I Close My Eyes) to remain in place until end of 2019, at minimum. 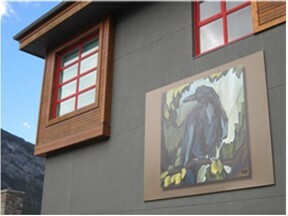 Banff Town Hall exhibition: Raven #2 was exhibited 2013-2014; Stuff Animals exhibit was extended to July 2017 as it was temporarily removed during its display because of hardware failure; Love is Touching Souls will be exhibited from July 2017 until end of 2018. Current Status: River Ribbon was installed in December 2017. Project description & goals: The previous booking and registrations software is obsolete and servicing expired in 2017, resulting in need to purchase new software. Procurement process was undertaken and BookKing was selected in spring of 2017. Improved reporting, online registration and payment and mobile point of sale and membership registrations (i.e. tablets for scanning membership cards at community classes, drop–in sports, etc.) identified as key features. Current Status: Project is 90% complete. Data transfer to new system is complete and on-line registration launched in the fall of 2018. All programs, services and facilities are now housed in the new system. Flex registration for children and youth programs is the only element still being processed in Class as we await the module development from BookKing(currently underway). A few remaining equipment pieces to support the new drop in punch passes and any supporting technology related to the child/youth program flex registration are still to be purchased in 2019 as we assess our needs for these supplementary pieces to best support the new system. Project description & goals: Town–wide wayfinding installation to enhance visitor experience. Current Status: The entrance sign on Norquay Road and a digital message sign to be located by the hospital are complete. 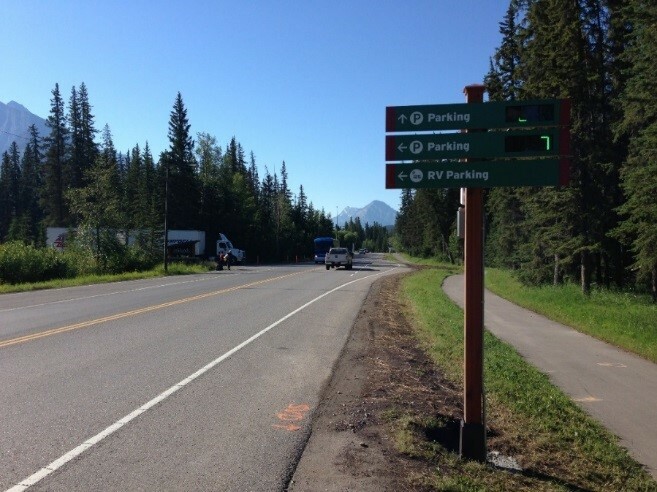 Discussions with Parks Canada on the location of the entrance and digital message signs on Banff Avenue (east entrance) are ongoing. 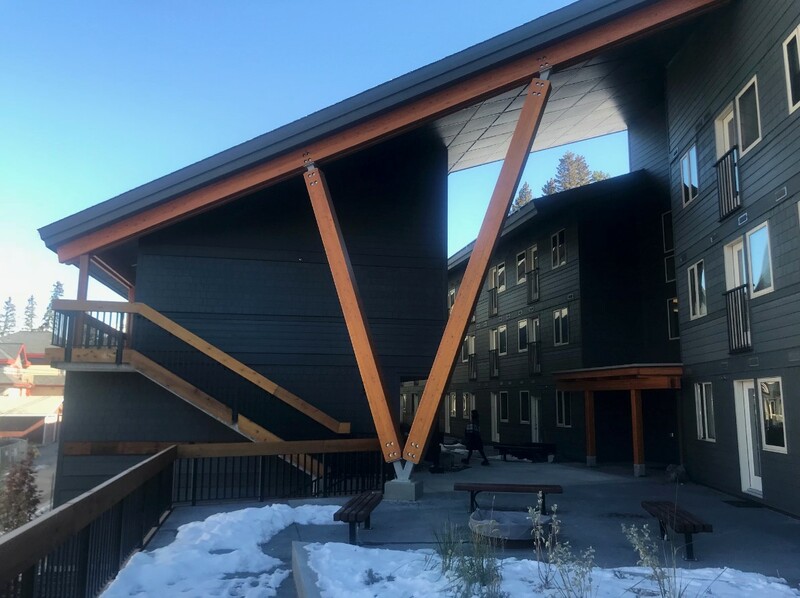 Project description & goals: Construction of 131 below-market rental units – designed to meet or exceed priorities of liveability, environmental performance, Banff Design Guidelines, ease of maintenance, construction and operating costs. Project to be self-funding - without the need for a tax subsidy. 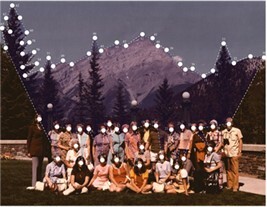 Parks Canada supplied land for a 131–unit development at a 95% discount. The Provincial Government supplied $11.9M in funding. The three main buildings achieved occupancy permit in late June 2018, 13 months after breaking ground. 114 out of 122 units are currently occupied. Rents for all units are 10-15% below market rate. 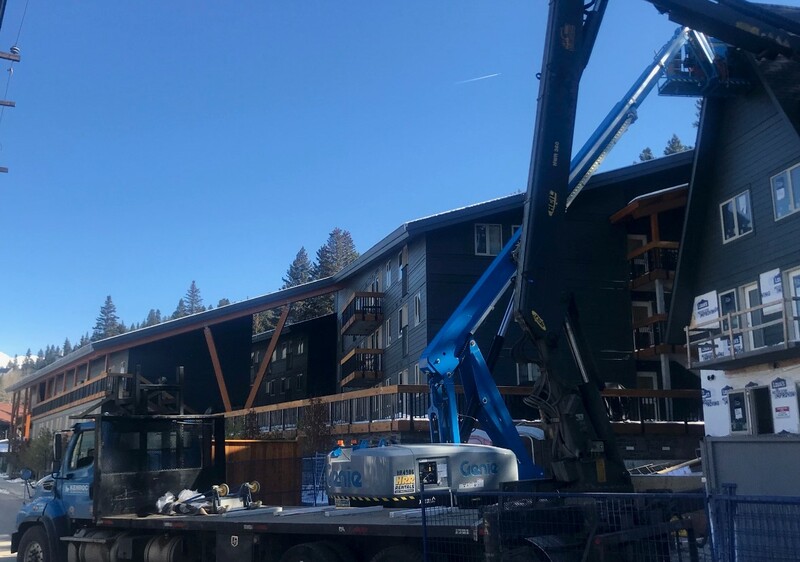 Construction of a further 9 units in 3 A-frame buildings is underway and scheduled for completion in November 2018 - 4 months after breaking ground on those units. The project was completed on schedule and is currently under budget. The building exceeds 2011 National Energy Code of Canada for Buildings (NECB) reference building efficiency (minimum building code) by 23%. Electricity costs for the entire building, including all common space lighting, fans and pumps, elevator, door openers, suite heating, lighting and cooking and temporary power to the A-frames under construction were $5,000 ($41/unit) for the month of August when 110 units were occupied. Replacement of stormwater and sewer manholes in the lane as part of servicing the building. Reconstruction of Coyote Lane, including paving and stormwater management improvements. Sidewalks along Antelope St and Marmot St.
Formalization of 90 degree angle parking on Marmot St and pavement renewal. Extensive tree planting along Antelope St and in the Deer Street ROW. An official ribbon cutting ceremony is scheduled for October 17.